I prepared two ways to solve this problem. 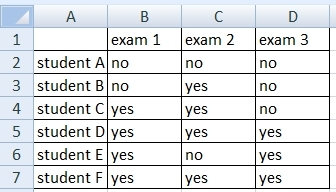 The first uses values in a new column and the second uses array formula. Both have their advantages. Table in the picture below contains information about the success of students making 3 exams. Value “Yes” means he passed, value “No” means he did not pass. 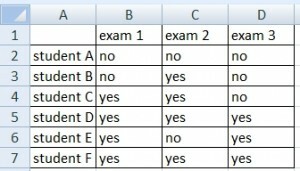 Student should have value “Yes” in each column to pass all exams.